On November 1, 1944, Metropolitan Andriy Sheptytsky departed this life. His funeral was held on November 5. It is difficult to reproduce the discolored and frail photos of the times in a newspaper, but those who have ever held one in their hands know only too well that for Halychyna that day was a sort of manifestation of national cohesion and devotion to the church. Still among us are people who took to the streets on that autumn day and went in procession across the city, well aware of the imminent danger. Yet they could not help doing this, for they venerated Sheptytsky as a saint when he was still alive — the unanimity on this point was simply astounding. There have been many changes over the past sixty years. We live in independent Ukraine, but the struggle for our souls is still going on with greater, not lesser, fervor. This is why now, when human minds are full of cynicism and hearts are full of mistrust, we must speak louder about such personalities as Sheptytsky. Yes, we must debate and reveal new facts to defend our viewpoint, express ourselves, and allow others to express themselves-in other words, seek the truth. In this search I consider the most authoritative opinion (I hope historians and theologians will forgive me) to be that of an extraordinarily interesting woman who has devoted herself to Sheptytsky — Oksana HAYOVA, chief of the Religious Studies Division at the Lviv-based Central State Historical Archives of Ukraine. All the following facts, dates, events, and proper names are largely the result of Ms. Hayova’s painstaking research, for which we heartily thank her. On July 29, 1865, a third child was born into the family of Count Ivan Sheptytsky in the village of Prylbychi, Yavoriv district. The baby was christened Roman-Maria-Oleksandr. 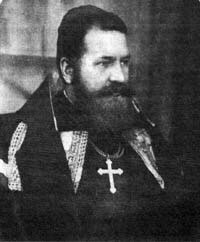 This was the future Metropolitan Andriy Sheptytsky, one of the most prominent figures of the Ecumenical church in the 20th century. The Sheptytskys belonged to an ancient Ukrainian clan first mentioned in 13th-century chronicles. There were seven sons in the family of Count Ivan and Countess Sophia. The firstborn son Stefan died at age two. The second, Yury, passed away when he was seventeen. Before speaking about Metropolitan Andriy, we must mention his mother, Countess Sophia, who was the daughter of the well-known playwright Oleksandr Fredro. On April 17 of this year we marked the 100th anniversary of his death. She was also the mother of the Divine Servant, Metropolitan Andriy; the blessed Klymentiy, baptized Kazymyr, who died in Vladimir prison camp in 1951, refusing to betray his church; and Leon Sheptytsky, who was executed together with his wife Jadwiga in September 1939 by the Bolsheviks. Countess Sophia was also the mother of Oleksandr Sheptytsky whom the Nazis killed in 1941. She was a woman who bore seven children, all of whom lived a tragic life — tragic and majestic. She is a worthy subject for a book. The future metropolitan Andriy spent his formative years in a profoundly spiritual and intellectual family. He was primarily influenced by his mother, who raised him in a religious spirit, while his father helped him to identify his Ukrainian roots. Count Ivan often took him to Univ Monastery, the center of the Kyiv and Halych diocese, to see the portraits of his ancestors Afanasiy and Lev Sheptytskys. The construction of St. George’s Cathedral in Lviv was begun under Atanasiy and finished under Lev. At the age of twenty-three, he graduated from university as a Doctor of Law, then left all his property to the secular world, and took a vow to serve God as a monk in the Basilian Order. When he was thirty-four, he was consecrated as bishop of Stanyslaviv, and a year and a half later as metropolitan of Halych, archbishop of Lviv, and bishop of Kamyanets-Podilsky. Metropolitan Andriy headed the Ukrainian Catholic Church for forty-five years, developing, strengthening and deepening the people’s religious life. Yet his activities went far beyond the limits of the church. It is common knowledge that Metropolitan Sheptytsky purchased a building for and founded the National Museum in Lviv. He may be described as not only a pastor and church figure but also as a patron of Ukrainian art, culture, research, and education. Nor did he disregard social welfare issues. The Sheptytsky family owned the villages of Prylbychi and Devyatnyky, as well as several buildings in the city of Lviv in which the metropolitan established orphanages. He also founded a mothers’ refuge — if a woman was in dire straits, she could come there with her children. Incidentally, the first Ukrainian school, also established through the efforts of Metropolitan Sheptytsky, stood right next to this refuge. He would sternly enjoin every convent to organize an orphanage, where nuns would care for parentless children. It should be recalled that two world wars occurred in Metropolitan Andriy’s lifetime, which left very many children orphaned. The largest orphanage, later named after Andriy Sheptytsky, was set up in 1918. We sometimes ask what he built and what he wrote. He accomplished many things, despite the historical context and conditions in which he lived. Above all, the metropolitan was the head of a church and a stateless people. So he saw his foremost mission in protecting this nation at all levels. Why did he not deal with purely religious affairs: monasteries, liturgy, rites? Why did he need to worry about elections or state building: because he could not stand apart from the lives and problems of his flock. Otherwise, all his words would have remained just that. In the fifty years of his activities, the metropolitan raised the Ukrainian Catholic Church to an unheard-of level. It is distressing to note that the main goal of the metropolitan’s life was being ruined right before his eyes. When he died, Soviet troops had been in Lviv for three months, which gave rise to the situation described by the Rev. Klymentiy in a letter to his relatives: “Hard times have come. All Greek Catholic bishops have been in jail for a month — they are being pressured into embracing Orthodoxy. Thank God, the clergy is standing its ground and adhering to the faith in spite of incarceration, threats, etc. But the Lord is merciful in these hard times and will never abandon us. I still stay at St. George’s in my old room, but no one knows how long this will last and what tomorrow will bring us.” Tomorrow brought Siberia. Metropolitan Andriy, who died on November 1, was a true prophet who predicted the resurrection of the church, which actually happened in 1990. What warms our hearts is not so much his activities as a church figure, theologian, and academic as the way he cared for the common people, and the incredible delicacy that he displayed when he was offering this help. Apart from wars, there were also floods and famines, for example, the floods of the 1920s and 1930s. When terrible floods wiped out entire villages in the Hutsul region, Metropolitan Andriy organized a relief campaign. Picture this: wagons are rolling toward the Hutsul villages, and small five- and seven-year-old children with bloated bellies are standing by the road. When they are offered food, they say, “No, we have just eaten. Daddy told us not to take any.” Then they would faint. The Hutsuls believed that only a ne’er-do-well had nothing to eat and wear. If you worked, you had something to eat and must not go around begging. The Metropolitan thought about what to do. He convened a council and said that people should be given any kind of work, for example, embroidering towels to decorate churches, etc. He helped set up arts and crafts courses so that people could “find” a job and thus be able to accept relief supplies.